What is it? Maybe you're old enough to remember watching Quantum Leap as a teenager. Dreaming of traveling back in time to save the world, having adventures in a different place and a different time each and every episode you watched. 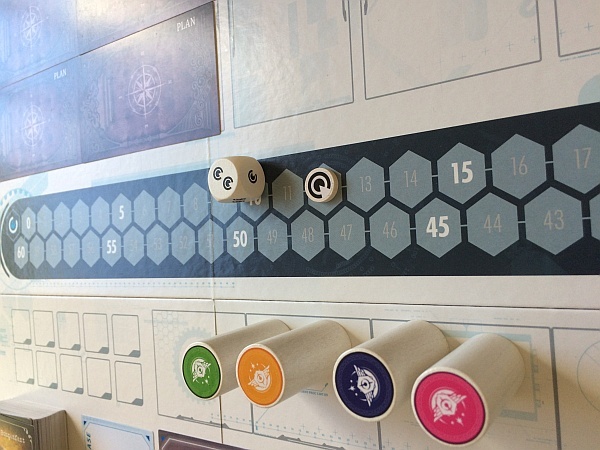 T.I.M.E Stories offers an ambitious gaming system that allows players to plug in different adventures and ride that space-time continuum rollercoaster while solving schemes to keep the flow of time intact. 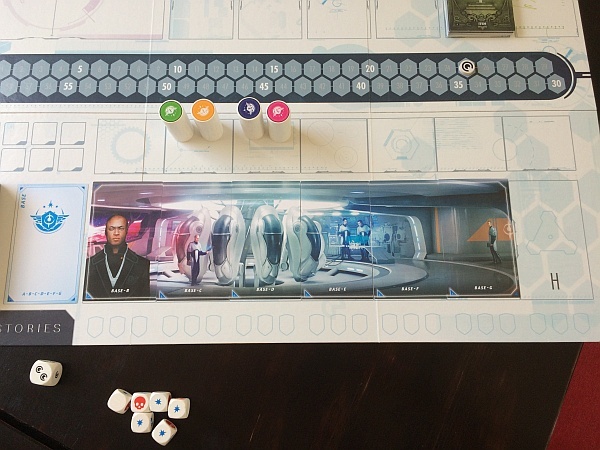 Would you rather watch reruns of the show or experience a quantum leap in boardgame design? I’ve written the start of this review around 10 times and failed to convey exactly what I want to say about T.I.M.E. Stories. Each time, I’ve chosen specific words and gone down a certain path but never managed to finish the opening paragraph before I hit that delete key and return to staring at the minimalistic box sitting on the counter. Each planned linguistic construction uncovers different truths about exploring this world of time travel and in a review where nothing can truly be uncovered, how do I convey my emotional attachment to that world in all its varieties? Designed by Manuel Rozoy, T.I.M.E. Stories is a “decksploring” cooperative adventure system for 2-4 players. Players take on the role of Tachyon Insertion into Major Events (T.I.M.E.) Agents whose job it is to protect the space time continuum by travelling through time and preventing events that could change the course of history. You’ll do this by inhabiting a character (receptacle) from that time and place, complete with all their attributes, strengths and weaknesses, and with your fellow agents explore the area and neutralize the threat. Time travel takes its toll on the minds of the agents and the technologies used to insert their consciousness into the past, so you’ll have to complete the mission within time unit constraints or be brought back to the present and forced to begin another run in a groundhog day type scenario. The base game comes with a single mission and Space Cowboys plan to release a new mission scenario every 3 months which will make use of the base game’s components. Each panorama is different, and some are even locked with symbols should the players have not discovered the prerequisite information. Each time you visit a location, a panorama of cards will be splayed across the board to form an image that represents the receptacle’s field of vision. The Time Captain for that location (it shifts every new location you visit) will then read out a brief depiction of the environment and then players will choose which location space to visit and interact with, each card of the panorama depicting an individual space. For example, should you enter a classroom will some of you go and speak with the teacher or would you rather interact with the children looking suspicious at the back of the class? 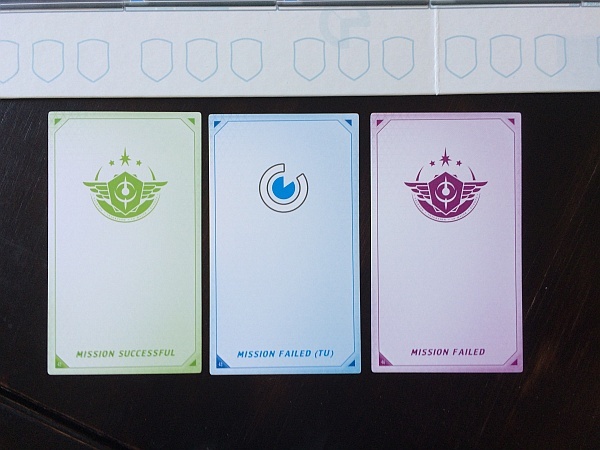 After players have decided which space they wish to investigate, from left to right of the panorama, each player on each space will get to turn over the card and read it privately (or in groups if multiple agents are on the same space). Interactions can be puzzles, combat, numerous attribute checks to perform specific actions or even simply just visual or written information that provides clues to solving the mission. Receptacle attributes vary from mission to mission. The check below requires 4 successes. While 3 have been rolled, the red skull still exists and is triggered by the rolled skull! Tests, both attribute or combat, are resolved by rolling the number of dice corresponding to the aptitude of the receptacle. The difficulty of the test is shown by the number of shields required (successes) by the agents on that space to complete it. 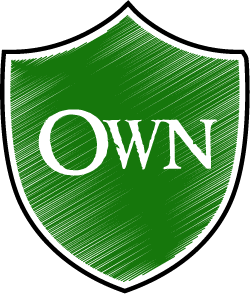 As successes are rolled, shields are removed in a left to right fashion and once all have been removed the players can follow the instructions on the card. Tests that are hazardous to players’ health have special shields on them; red skulls may trigger damage to receptacles based on die rolls and resistances, heart shields depict a constant loss of health by players who attempt the challenge until it is removed, and shields with time icons indicate units of time lost by failing to complete the challenge that round. Should a receptacles health be reduced to 0, the agent is immediately ejected from the dead vessel and will only be able to rejoin his party after a further 7 time units have passed, being injected into another available receptacle. Should all agents die, they will immediately be forced to reboot the run, and start from the beginning again with the knowledge gained from the previous run. Investigating areas costs time units, and moving to various locations inside the mission parameters will also cost you between 1 and 3 time units, dependent on a dice roll by the current Time Captain. Should you run out of the time units provided in the mission parameters, expect to be recalled to the present in order to reboot the systems and begin the run again. Every reason for reverting back to mission control has a corresponding narrative card giving you additional context to your mission. T.I.M.E. 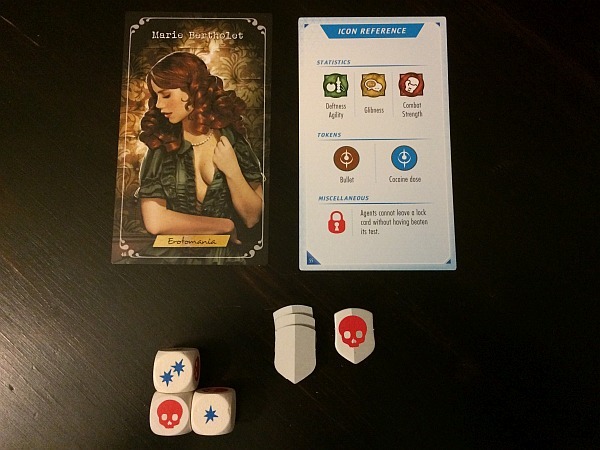 Stories is unlike anything else I’ve ever played before in a board game. While many narrative games lull you to sleep with randomized roll outcomes or an endless disjointed storyline, Time Stories keeps you engaged as a group through novel factors and well balanced gameplay. The mechanic of players privately interacting with their specific area and then relaying the information to the rest of the group in their own words, creates captivating moments in which your team hangs from your every word. With time not in your favour, your group will face difficult decisions of where to go, who to speak to and what to explore based on their own interactions with the environment and the unique characters that inhabit that world. The overwhelming and often sprawling world seems endless as you hone in on your mission objective, knowing that your final score is dependent on preventing the anomaly in the shortest time possible! The whole experience is a puzzle, wrapped in jaw-dropping art and with enough burn and bite to keep our team of agents at the edge of their seats. Finding the clues and evidence to discover where to go, picking the best receptacles for certain tasks and solving actual mental puzzles in T.I.M.E. Stories creates one of the most complete gaming experiences I have had since I discovered the hobby. In the mission that ships with the game system, our team entered a French Asylum in the 1920’s dealing with the emotional imbalances of our receptacles in a plane of existence that we were all unfamiliar with. What followed were some of the most immersive and captivating 4 hours of gaming most of us have ever had, with cheera as puzzles were solved and clues discovered followed by groans as investigations led us astray with red herrings or combat killed off many of our agents in a twist we never saw coming. These moments cannot be shared in this review, as they would render your exploration of this world shallow and expected. Every Action, Every Roll of the Time Captain’s Dice brings you closer to Rebooting your Run. There lies the greatest pitfall that many gamers will have with T.I.M.E. Stories. Once you have played through a chapter and solved that mission, you’ll never play it again. There aren’t multiple endings, or different playthroughs for different receptacles and at an R850 ($50) price tag for the base game and R500 ($26) for each mission (to be released every quarter) it may be a bitter pill for many players to swallow. Our group is splitting the cost of the game and each of its expansions, so for 4 hours at around R125 ($6.50) it still becomes cheaper than many other forms of entertainment. Another niggle that didn’t bother our group but may bother yours, is that you will have to replay certain parts of the mission at least once if not two or more times in order to get the items/clues you need to finish the mission. Lastly if you or your group dislikes puzzle games, then we’d recommend being slightly more cautious about buying T.I.M.E Stories. We sat on a puzzle or two for around 10 minutes staring blankly until it clicked yet loving every moment of it, but it’s not for everyone. I’ve told you so much but yet so little about this game. What I can say in closing is that it has redefined what I expect from this board game hobby in a single gaming session. 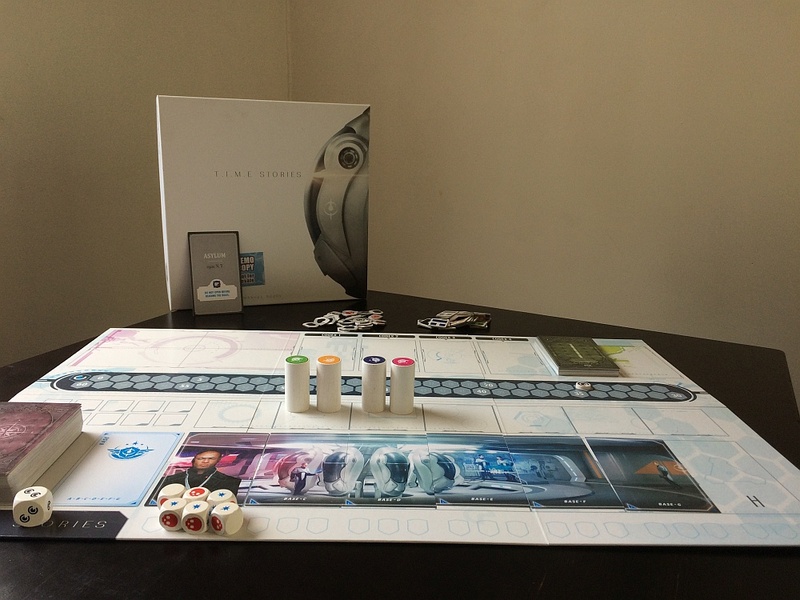 With the best art of 2015 (in my opinion) and the most immersive and captivating gaming experience I’ve had this year, its impossible for me not to recommend you buy T.I.M.E. Stories. Share the cost with friends for a game that’s unlike anything you’ve played before. We got lost in the narrative, the puzzles, the characters and the world of Asylum as T.I.M.E. Agents and I haven’t stopped thinking about it since Saturday. Now excuse us while we go solve the mystery of a missing girl in 1992 as a plague sweeps across America. Promotional consideration was provided by Digital Sushi of Skycastle Games in the form of a review copy loaned to us. Once every few years, we get to discover a game that changes the view we see our hobby. Things like the Legacy system, Dominion deckbuilding and card drafting have changed board game development forever. I truly feel that the T.I.M.E. Stories system has done something similar in its approach to Narrative puzzle games and we at Cardboard Quest will be playing each episode, hoping that the future is in every way better because of the past.